Set in post-war America, Ty Landers’ short story tells the tale of an outcast who became a local hero. Illustrated by Masoud Keshmiri. Sebastian Shull was seven feet tall and fresh off the bus from Chicago when John Moran hired him to deliver death notices to the women of Burr, Maine. He arrived in town with nothing but a change of clothes and the black mark of being 4-F (physically unacceptable for military service) hanging over his head. After Pearl Harbor, every able-bodied man either volunteered or was drafted. Shull tried, but the Army wouldn’t take him due to his height. Everyone at the processing station marvelled at his frame and posed for awkward photos with him, but after the flashbulbs popped, Shull was given the bad news: the U.S. Army didn’t take any man under five feet or over six feet six inches. He was told he’d probably be a fine soldier, but the Army didn’t have pants that would fit him. Shull told Moran that not being able to fight was eating him and not contributing would define him. He said he felt like a big man, at a big time in history, left behind to do small things. The statement was so sincere it convinced Moran to give him the job. Burr was a glowing little village jammed between sweeping pine forests and craggy rock coastlines. When Shull first saw it, he thought the sea and the trees and the quaint little buildings buried in snow looked as if they had been stitched out of felt. It looked warm but fake, like a fictional place drawn for a Christmas card. Yankee hospitality in small towns like Burr typically called for extravagant welcomes with introductions, invitations to churches, and parades of casseroles for new community members. Shull received nothing. His life became a numbing procession of somber incidents. Moran was right, the war was bad and by the fall of 1944, Shull had visited almost every family in town. He was ignored, avoided, and ostracized to the point where his only human contact became work chatter with Moran and death talks with newly minted widows. 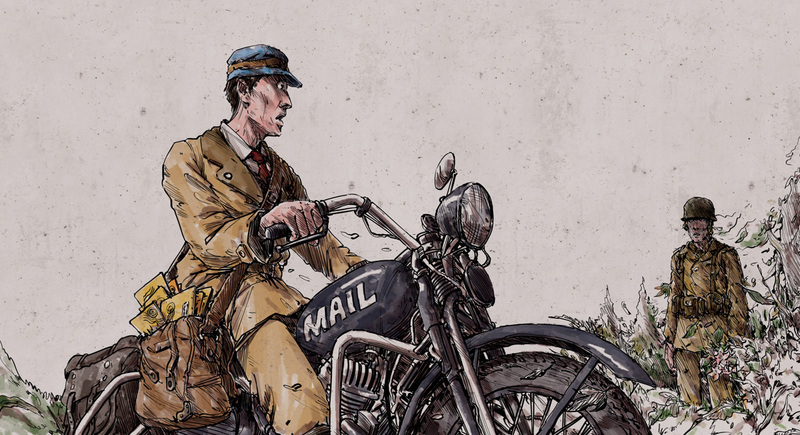 Moran had given him a motorcycle to make his deliveries; a black Harley Davidson WLA with a sidecar and the word ‘MAIL’ painted on its gas tank in blocky white letters. Shull started exploring the logging roads that wound through the woods and skirted the coastline. The detours gave Shull time to clear his head and play over the day’s deliveries in his mind. What he might say. How he might say it. These trips helped, but he still hadn’t adjusted to the job. It was never easy to deliver bad news and Shull did it all day long. On the way back into town, the logging road ran past the Kissing Tree, a local landmark that overlooked Burr’s rugged coastline. It was a popular place to bring your sweetheart and every couple in town made a pilgrimage there at some point. Shull liked to stop there because you could see the lighthouse up the coast, and stopping delayed the next delivery. Shull shut the bike off, stretched out his long legs, and watched the sea bleed into the grey sky. It was quiet except for the sound of waves hitting the rocks below, but today it didn’t feel private or secluded. Shull scanned the trees around him and saw a young man in a combat uniform standing in the underbrush. Shull jumped at the sight of him. ‘You scared the hell out of me buddy,’ Shull said. The young man had a peculiar, surprised look on his face. Red and yellow leaves whipped around him in the breeze coming off the ocean. ‘Can you see me?’ the young man asked, stepping timidly into the clearing. ‘Um…yes, I can see you.’ He seemed lost and it made Shull uneasy. ‘Are you Shull?’ the young man asked. The name clicked. It was on one of today’s yellow envelopes, his first delivery. ‘Speck? Mary Speck?’ Shull asked. Shull sat quietly. The leaves blowing around them and the waves along the coastline were the only sounds. ‘I had to bring the flowers with me.’ Jack Speck looked over his shoulder, back into the woods, as if someone had called his name and told him to wrap things up. ‘They don’t bloom right now.’ Then he was gone. Shull walked into the road looking for traces of Jack Speck, but there was nothing. He would have believed he imagined it all if he hadn’t still been holding the Mayflowers. He placed them gently into the messenger bag and rode away from the Kissing Tree as fast as the motorcycle would carry him. Mary Speck was stacking stove-lengths in a tidy pile when the motorcycle pulled up. She had seen the tall stranger criss-crossing the streets and back roads of Burr but hoped they would never meet. He was thin and disheveled, beaten by the wind, hair tousled, black suit rumpled. She watched him unwrap his legs from the bike and considered calling out to him, telling him not to bother getting off. Seeing him there was the message. He could have just lingered at the curb and she would have known her husband was dead. ‘Yes ma’am.’ He handed her the yellow envelope. There was a heavy silence between them. Only the sharp edge of the wind disrupted the stillness. Her eyes widened. She reached a tentative hand out and took the flowers. Shull nodded and kept his eyes low. ‘I don’t think so.’ She smiled and a fat tear raced down her cheek. ‘Only Jack knew how much I loved these. They don’t bloom right now, you know? Won’t for months. Thank you for this kindness.’ She took one of his hands and kissed the top of it. ‘Come round for supper some time. You’re too thin.’ She turned and went into the house. Shull left her to grieve. He began seeing more of the men of Burr as the war dragged on. He saw eyes at night in the great pine forest. Faces began to pop out at him from the windows of homes, from shops closed up for the night, from the darkened beams of the railroad overpass bridge, and always near the Kissing Tree. All of them wanted to send messages and Shull obliged. A verse of White Christmas with altered lyrics from Hugh Jaeger for his wife Nora, or a message from Carl Graham for his beautiful, blonde wife Jeanne saying that he knew she was sleeping with a college boy and he would see both of them in hell. Many left wedding rings or other items that had taken on talismanic qualities. Some left instructions to stashes of money and some left nothing but words, in the tender clarity of men who had lost everything and realised the immeasurable value of a good wife. Shull never objected, no matter how strange or difficult the request, and continued to toil in obscurity until the day he wrecked the motorcycle by taking an icy turn and crashing into the sandwich board in front of Callahan’s Diner. He broke a leg and was forced to convalesce on a cot in the basement of the Post Office. When Mary Speck heard about the accident, she made him a casserole. She sat with him, making sure he ate, then relayed the woeful details of his living situation to Angela Cranston. Angela brought four men from her church to the Post Office and moved Shull out of the cold basement and into her house, where she kept a huge fire going and buried the big man under a mountain of comfy blankets. Jeanne Graham even came round and sat by Shull’s bedside, reading to him and pretending it wasn’t an inconvenience, although Shull suspected she did it as some sort of unnecessary penitence. ‘I appreciate what you ladies have done for me, Ms Cranston.’ She had told him to call her Angela hundreds of times but he couldn’t and never would. Shull didn’t know what to say. He smiled and hugged her, then limped out into the morning light and walked into town. Everyone he passed tipped a hat or gave a friendly hello.